At the moment, anything fashion related seems to have taken a bit of a backseat for me and not only here on my blog either but also in my real actual life too. I make no secret that I'm way more about the jeans and the sweatshirts than I am about fancy amazing outfits right now - I just don't have the time to bother about myself these days - not even when it's low key fancy-ness. So anyway, because any kind of fashion posts have been AWOL for far too long I wanted to post something a little along these lines today and then I realised that I have yet to mention a rather fabulous, unique, quirky little handbag number that I was oh-so lucky enough to win quite a while ago in a competition run by the very lovely Kelly. Now I've seen a whole host of these very original handbags on posts written by Kelly in the past and when I initially spotted this I knew straight away, without having to research, who the designer would be - Vendula London. 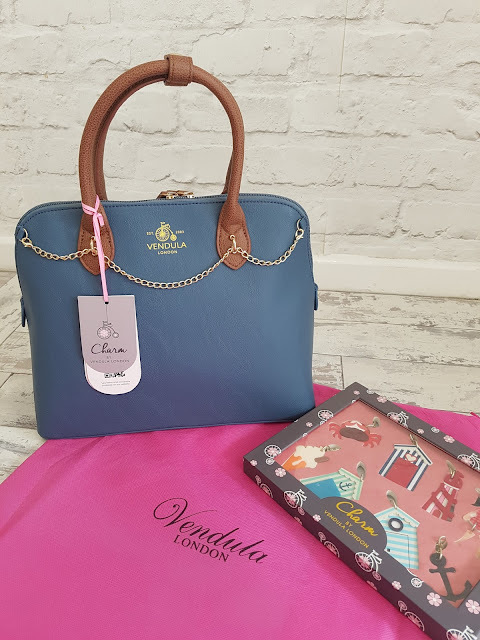 It is very hard not to notice the fab designs of Vendula London's bags when you see them - every one is fabulous, and really different but they all have something quite similar about them too. They really are amazing and very fun - I just love them. So imagine how fantastic I felt when the competition prize meant I was actually allowed to pick my own bag - I was given a choice of numerous different styles and colours as well as being able to select my preferred set of decorative charms too, making the end product something that was completely my own. But it was no easy task - there was just so much choice. I figured that because I am almost always dressed down (usually with a baby bag crammed full of nappies and wipes glued to my hip) then for those slightly more special, lets-get-dolled-up occasions a bag that would really turn heads and would get noticed would be the way to go, and for that, this bag works brilliantly. 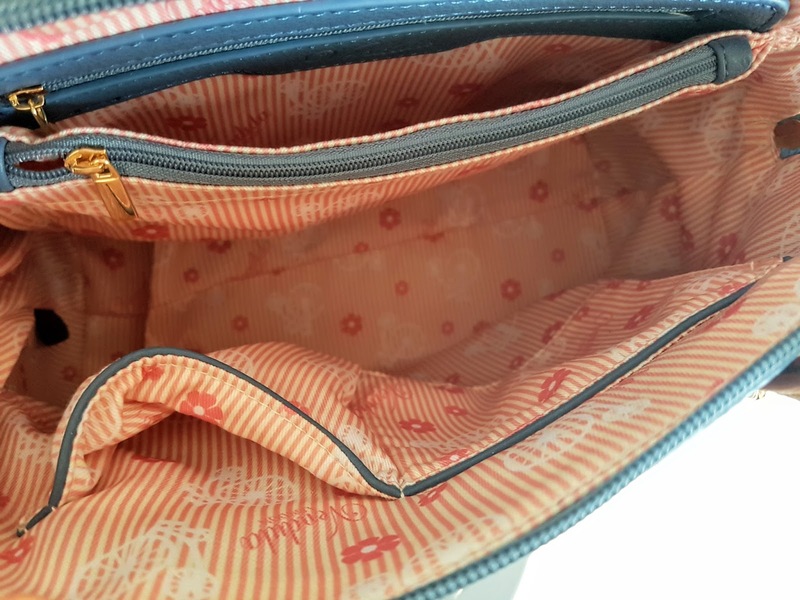 The bag itself is a lovely navy blue colour, it is sturdy without being heavy and is obviously very well made. It is easy to hold, either by the tan handle or the across body, shoulder strap meaning it is very versatile too. 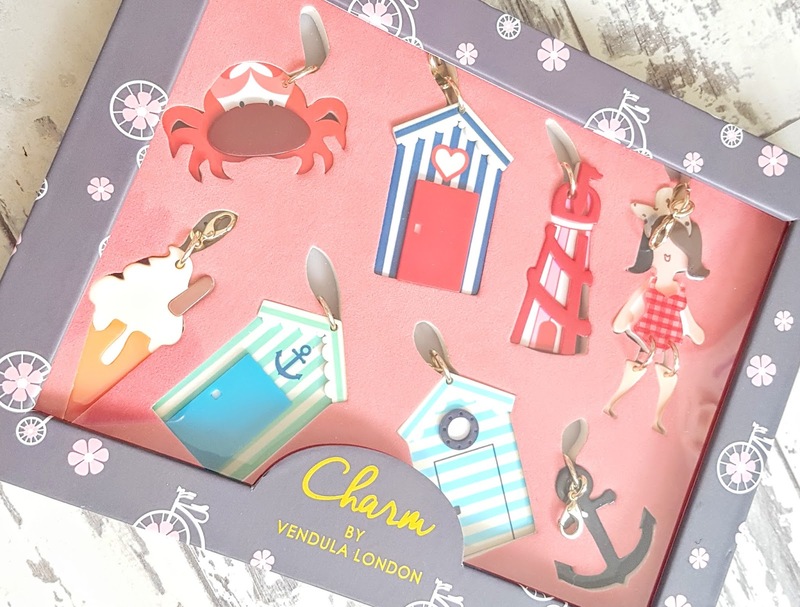 The idea of having the charms to add to the chain decorating the bag is something else I really like too - I love that they can be swapped and changed as often as is liked, adding a real edge to the bag as it can be made to match any style of outfit (depending on how many charm packs you have of course). I do love my Vendula London choice - it is a fab fashion accessory and I'm so very pleased I won it. LOVE the bag you chose, and glad you are happy with it! I think you picked the exact bag/charm combo I would have gone - now you need to hit the beach with those sea-sidey charms!